Elliott Wave Technician – Forecasting and research of the financial market using Elliott Wave theory, demographics and economic cycles. Forecasting and research of the financial market using Elliott Wave theory, economic cycles and demographics. Subscribe to our investment newsletter here. In 2018 our portfolio had 26.8% yearly return. Average cash holding on the portfolio was about 15%. The Debt Bubble to implode With all of the debt problems around the world, specially in Europe, Japan and the US, a contagion can begin at any time now, and defaults in one country will spread to other countries. This is is truly frightening. If history is any guide expect deflation to follow. 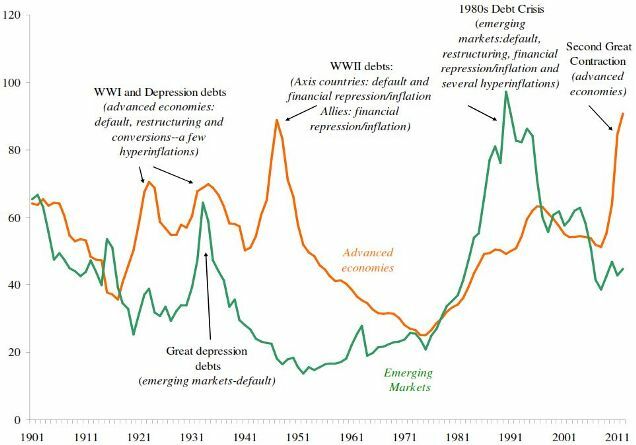 US history offer two previous previous periods of deflation in terms of magnitude 1835 – 1842 and 1929 – 1932. During these periods the value of financial assets almost disappeared. 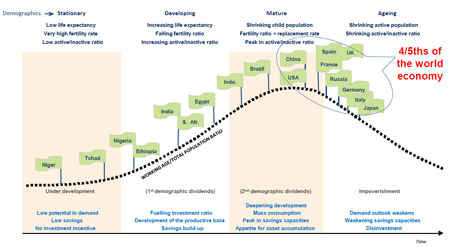 Demographic spending trends are the key factors driving the economy of the developed consumer countries. These trends are predictable and can be used for forecasting. New generations of consumers have a predictable behavior with the spending wave peaking at the age of 47-49 and then followed by a decline. Reflect over what this means for real estate, stock markets and bond markets in Europe. Learn more how demographic trends can work for your long term investments in our investment newsletter. Expect more bank runs in Europe Hold no bank deposit in the European Union. Cyprus is proof that deposit guarantees are worthless. We email our subscribers immediately (within a minute) when we buy or sell in our portfolio. We can help you to prepare and position yourself for what ahead in the depression. Join us and change the world. If you have investments or plan to invest in Europe you should learn more about the regions demographic profile and what it means for the future. Japan is leading the demographic decline. Russia and the European Union are following. Which countries in Europe are close to the tipping point ? By the time of Supercycle wave (a) low, America and the world will demand defense cuts as they never have before. Timing should be from late in the current decade to 2022-2023 where it should reach its intensity. The previous time in history this occurred was in the early 1930′s. Free financial advise regarding defense related investments: Sell your defense stocks and other related investments. The best time for that type of investments should be around 2022-2023 at the earliest. See the full article here. Social trends – The Education Bubble is bursting ? For years we have been talking about the education bubble and the problem that colleges charge tons of money and then graduates are unemployable and in debt. Colleges are responding by becoming job preparation centers. And Frank Bruni, opinion editor for the New York Times, says this is a waste of time and resources. Here’s what’s better: See the full article here. Historical chart with price of gold – from the Renaissance here. We are in a water economy, not an oil economy. The Commodity Picture evaluate the most import issues facing civilization. Most people think “Peak Oil” and “Climate Change” are the most pressing issues. The truth is it’s water. In depth look at water risk by environmental research and sustainability group Ceres and a comprehensive analysis from the Natural Resources Defense Council, which map areas at high risk of water shortage conflict. A close look at water supply and consumption in America’s largest cities, with focus on the thirty largest metropolitan areas. The analysis identify ten cities that are likely to face severe shortages in the relatively near-term future. Learn more here. Currency ETF’s and ETN’s are trading vehicles that make it easier to invest in currency trends, but research each one before you make any trades. See our investment newsletter or portfolio to find the ones we find the most suitable and how to use them. You can find under Education Center a complete overview called “Currency ETF’s and ETN’s”. Financial repression targets the producers of society, i.e., the middle class, and therefore harms the economy. By destroying savings with a zero percent interest rate policy, which reduces government borrowing costs, but deprives savers and pensioners of interest income, and prevents capital formation.